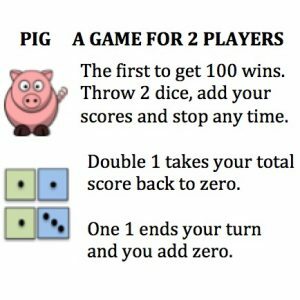 Both players start with zero points and take turns to throw the dice as many times as they like adding the total at each throw to their score. Suppose you throw a double one. On the next throw, is your chance of throwing a double one the same, more likely or less likely? On each throw, which of the following 3 options is most likely and which is least likely? How do you know? (C) Two numbers other than 1. Can you work out a strategy so that you can win more often than you lose? 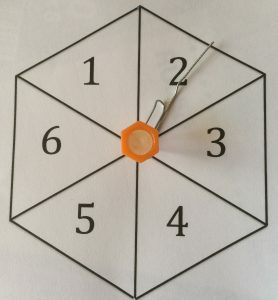 You can make your own spinner if you don’t have dice. You will need a paper clip and a pin and will need to spin the paper clip twice for each ‘throw’. Draw a regular hexagon and write in the numbers as in the diagram or use this template. This problem is adapted from an NRICH task Piggy Ones with permission of the University of Cambridge. All rights reserved. You can also play a different version of the game here Piggy Sixes.